As a severe food crisis strikes Niger and hunger looms in neighbouring Mali, Burkina Faso and Mauritania, the BBC News website asks what lies behind such food shortages and examines how hungry people are helped. What causes a severe food crisis? Serious food crises occur when people cannot get enough nutritious food to eat. They can be triggered by natural disasters, conflict, political instability, economic failure or even epidemics such as HIV. Famine occurs when several of these factors are made worse - usually by governments' failure to deal with the situation. Food prices are driven up, overwhelming systems of health, law and order and causing widespread death from malnutrition and disease. What does it mean when someone is acutely malnourished? 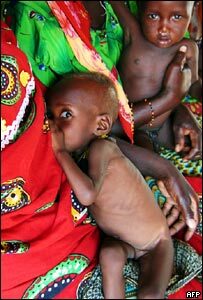 Acute malnutrition is the result of sudden weight loss due to starvation and disease. Characterised by "wasting" - which means children are far skinnier for their height than healthy children - acute malnutrition often leads to rapid death as it increases the risk of infection and can mean that vital organs stop working. 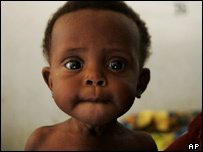 Acute malnutrition can be treated but it may have long-term effects on physical and mental growth. More than 50 million children worldwide are acutely malnourished. How do aid agencies keep track of hunger? They already know which areas are most at risk and use a wide variety of tools to measure changes in food availability. These include satellite weather technology to estimate rainfall and crop assessments which can help predict harvests. They also carry out nutritional surveys so that they know how much people are eating and also examine the political situation which might affect the hunger of a population. Local staff in the field also channel information from the ground. Areas of hunger can change dramatically within a single country and these tools create a picture of areas that need special help. How and when do aid agencies intervene? The World Health Organization considers a situation to be "emergency out-of-control" when four children of every 10,000 die per day from malnutrition and other causes. Non-governmental organisations, aid agencies and charities are often present long before crises erupt. But when they are and the local government cannot handle the problem alone, major emergency operations are initiated to get much larger quantities of food aid to hungry people. Food can be on the ground in as little as 48 hours. But aid agencies rely entirely on donations from the public and private donors for their work and if money is not provided, there may be little they can do to help. What are people given to eat and why? The World Food Programme emergency ration includes about one and a half cups of rice or flour, a tablespoon of beans or lentils, a spoonful of oil and a pinch of salt. It costs an average of $0.29 and provides 2,100 kilocalories - the recommended daily energy intake for active adults. The people most at risk of malnutrition - especially women and children - often receive specially blended foods that contain all the vitamins and minerals they need to survive. They may be given this food in biscuit form or in a flour which can be mixed into porridge. The average cost of a day's ration of high-energy biscuits is $0.55. In the very first days of an emergency - such as a refugee exodus or natural disaster - when people are not able to cook their own food - aid agencies can provide biscuits, rations or even freshly baked bread for people. Food can be bought in the country affected, in neighbouring countries, from overseas or directly donated. Buying food locally means that the locally economy is supported and food can arrive quicker. In a crisis situation aid organisations use any means they can to transport food, by air, sea or land or even by elephant, donkey or yak. They make a rapid calculation to decide which means will get the food there in time, at the lowest cost.